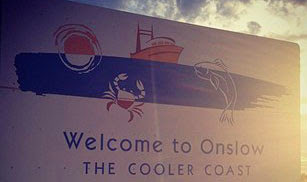 As we drove into Onslow the sign said Welcome to Onslow - The Cooler Coast. Mmmm now let me see yesterday it reached 37c and at 10.00am this morning it was 32c!! Onslow is in a great location for photographers, outside our van I can walk 10 steps to get some sunrise shots and if I walk around the point to I can get some sunset shots. 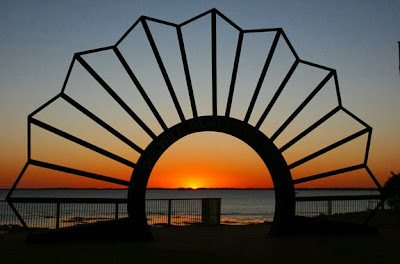 So I got up early this morning and walked up to the War Memorial and indulged in greeting another beautiful day. The caravan park is pretty much deserted at the moment as it is the AFL (Australian Football League) Grand Final today. The teams playing are Hawthorn (Victorian Team) and Fremantle (Western Australia Team). Needless to say, seeing I am in WA everyone has been walking around in Fremantle colours and are barracking for them. I am so glad I don't care who wins I can just enjoy the game. Maybe 'cooler' as in 'cooler man'! !